Story of the World curriculum is always discounted at Schoolhouse Publishing! 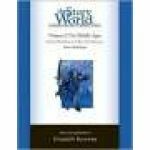 Story of the World by Susan Wise Bauer (PeaceHill Press) is written for kids in approximately 1-8 grade, but has a wide appeal even for older students. Story of the World -History for the Classical Child is well-written, and my kids found the stories appealing. Susan Wise Bauer takes the child through the history of the world in 4 volumes in short vignettes of famous people and events. The books can stand alone as history readers. I’ve only used the readers, not the activity books, to supplement our studies in Mystery of History and TruthQuest. Please note, though The Story of the World doesn't totally ignore God in its pages, it is written in a way to make a non-Christian student feel comfortable. In other words, it isn't about His story, it's just about history. To compare Story of the World with other history programs, click here for a handy, printable chart that compares many of the most popular homeschool history programs. The Story of the World Activity Books are simple to use and include a parent's guide, comprehension questions, the narration exercises, and additional activities and reading. The activities include ideas such as making a "cave painting" and making "purple dye". There are also maps, coloring pages, puzzles, games, paper dolls, and comics. 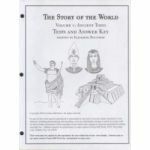 The Story of the World Test Booklets contain 42 tests, one for each chapter of The Story of the World, perfect for evaluating comprehension and retention. The narrative format of The Story of the World helps children remember the famous people, places, and events in history. These tests offer you an easy way to make sure that your child is absorbing the important events of world history. A combination of multiple choice, matching, fill-in-the-blank and short writing samples allow you to evaluate your child's retention and comprehension of key events in The Story of the World readers. The test package contains an answer key for all tests. pages, puzzles, games, paper dolls, and comics.